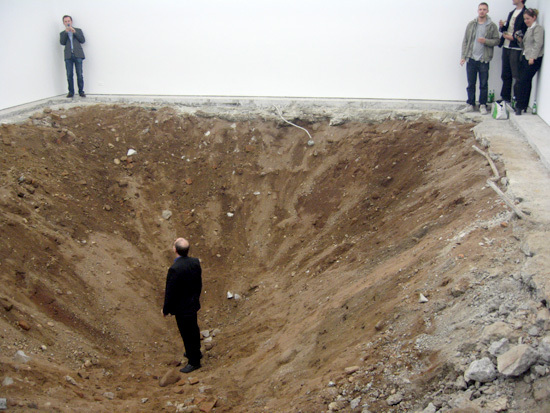 Urs Fischer, the artist, called the hole “You”. A rich guy bought it for a whole lot of money and took it to his estate in Connecticut. Well, not the same hole, he had a hole dug just like it. So he paid a whole lot of money for another hole. I guess you look in it and think how rich you are. I assume the first hole, now that it was sold, was just a hole again and was filled in. Too bad. Imagine how much it would have been worth once the artist dies. They could have buried him in it, crammed in with the chaos and contradiction. This was before the recession, though. I have no idea what the going rate on a hole is now. Maybe the Chinese are buying them up. Or maybe holes are just holes again. Free fill dirt. I wonder if big rocks are still in. Or did LACMA get the only one? I think I picked the wrong gig. If I were an artist this blog post would be worth a zillion dollars. This entry was posted in Art and tagged Urs Fisc. Bookmark the permalink.